Perimeter Patrol™ Security Partitions Create Enclosed, Secure Spaces For Outdoor Areas. Perimeter Patrol™ Security partitions help create wire fences that are great for limiting access to restricted areas. Framing is made of 1-1/8" diameter x 19 gauge tubular steel. All panels include two galvanized clamps attached to each panel and 24"L x 9"W steel base plates. Reusable Engineered Pallet is included with Perimeter Patrol 7.5' panels only. Makes unloading and loading easy and safe while providing storage when panels are not in use. Designed for storage of both bases and panels. Safety yellow base plates allow floor anchoring for permanent installation. Chain Link Panels are made of 12 gauge, galvanized finished steel with 2-3/8" diamond openings. Chain link panels feature a horizontal support for added strength and rigidity. Welded Wire Panels are available in Galvanized, Black Powder Coat or Perimeter Patrol™ Yellow Powder Coat finishes. Wire fences are made of 8 gauge wire in 2" x 4" welded mesh pattern. Perimeter Patrol™ Panels are reinforced with a vertical 1-1/8" square tube steel support for extra strength. 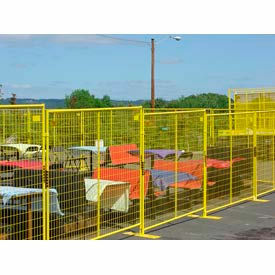 No Climb Panel is available in choice of Galvanized or Perimeter Patrol™ 7'5" Yellow welded wire. Panel includes 2 panels and 4 connectors. Add 1' or 2' of height; installed vertically. Wire Panel Wheel Kit converts a panel into a swing door for limited access to secure areas. Made of yellow powder coated steel for safety. Includes 20"L chain for security (lock sold separately).